Something happened to me in the East Cape of Baja in 2003 that changed my life. I landed a blue marlin from a kayak, and for the hour that the magnificent beast towed me around in the Sea of Cortez, I felt intensely alive. The huge billfish was grey hounding not 50 yards from me, waves are splashing off my bow, and I was going so fast that I had to put my feet over the sides to keep from tipping over. Talk about getting close to nature! When I got back to the states, a friend of mine said, “The good news is that no one has ever done that. The bad news is that, from here on out, your whole life is downhill!” That sounded depressing, but to tell you the truth, I couldn’t argue with him. What else could I do that would give me the same rush as that, fighting a fish of that size at such close quarters? 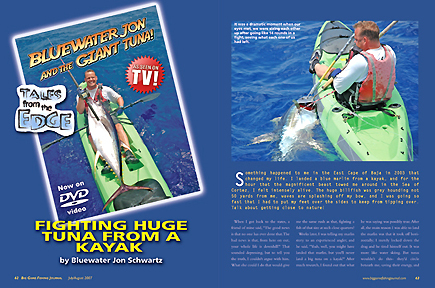 Weeks later, I was telling my marlin story to an experienced angler, and he said, “Yeah, well, you might have landed that marlin, but you’ll never land a big tuna on a kayak!” After much research, I found out that what he was saying was possibly true. After all, the main reason I was able to land the marlin was that it took off horizontally; I merely locked down the drag and he tired himself out. It was more like water skiing. But tunas wouldn’t do this - they’d circle beneath me, saving their energy, and to bring them up, I’d have to do a lot of backbreaking labor to raise the fish. Not only that, but I’d have to do it without a lot of the tools that anglers on a boat use. If I used a harness and the fish dove, he might take me with him and drown me, and there’s no place for a fighting chair on a kayak! Finally, there’s the end of the fight details. The marlin only came up when he was spent, and I was able to simply grab his bill. Game over. In contrast, everyone I talked to told me that tunas don’t do that- they come up with a lot of fight left in them. If you’re in a boat, you gaff them, pull them out of the water, and you’re done. 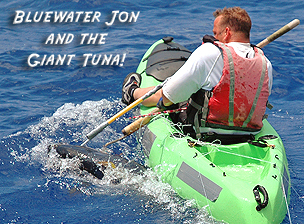 But in a kayak, you gaff a big tuna, and you have attached yourself to a raging bull that’s still in his element. How was I going to deal with a thrashing tuna at yak side? Since this had never been done before, I had to get creative. Not only that, but I had to be careful who I shared my plans with. Most anglers scoffed at me, and told me I was crazy for trying it. Well, it so happens that I teach elementary school on a military base, and I am friendly with a lot of Marines. These guys are trained in combat, you know what I mean? So I took one of them aside and said, “Ok, imagine you’re in a kayak and a huge tuna is 2 feet from you and you have to kill it, what do you do?” and instead of snickering, he broke out in a huge grin. These guys became my best source for information. In fact, one of the guys was a medieval times buff, the kind that reenacts battles. Next thing you know I’m pricing out double edged battle axes on the internet! Cut to the chase, I ended up in Puerto Vallarta for my first attempt. I hired a panga to take me out to Corbetena, a seamount about 35 miles out, where cow yellow fin and grander marlin lurk. He dropped me off with a baited rod, and I paddled around. I had little experience battling tuna, and I’d never used a reel bigger than a TLD-25, so I was in for a big surprise. He gave me a rod with a 50 wide with a 5 pound skipjack and told me to paddle in “that” direction. About 20 minutes later, the water comes alive around my kayak, my bait gets nervous, and then my line made this sound that scared the hell out of me. Made the hair on my neck stand straight up! I panicked and slammed the drag down, and the line broke. The next few days out there at Corbetena were a big learning experience for me. I got into a lot of battles, and most ended the same way- the tuna would circle to my back left, I’d get exhausted, the only muscle in my body I was able to use was my left bicep, I’d end up on the ropes playing defense, and they’d come loose after about 45 minutes. The biggest tuna I got up was a 35 pounder and when I sunk the gaff in and hoisted him into my lap… well, you know that sound they make when they beat feverishly against the deck of the boat? He was doing that against my chest! Moreover, I spent most of the trip paddling around, chasing the schools of tuna in a haze of frustration. They’d breeze right under me and within a minute be half a mile away. It was a crazy game of cat and mouse. If I was ever going to battle a really big one, I was going to have to do things differently. My next stop was the “Land of the Giants” off of Hawaii’s fabled Kona Coast. 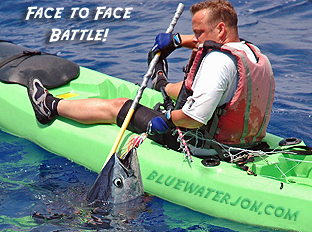 By this time I had decided that hooking a huge speeding tuna from the kayak in the open ocean under paddle power alone was an unrealistic goal. 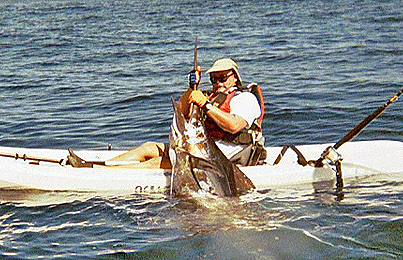 With their speed, I could spend a lifetime trying to hook a big one, so we decided to hook one from a boat and then launch me in my kayak. Dealing with the huge tuna- fighting him, raising him, and then subduing him- were the goals now, and as you will see, they’d prove to be more than enough of a challenge. I would be using two new tools in my arsenal this time, too. Instead of using the standard 5’6” trolling rods, I had some custom graphite rods made for me that were only 4’10”. This would allow me to keep the rod closer to my chest and enable me to make use of a wider range of muscles. Then there was the “clincher”- a spear I made out of a broomstick, duct tape, and railroad spike that would, in theory, to permit me to deliver multiple deadly blows to the tuna without ever attaching myself to him. In addition to these tools, I’d employ new techniques. One I actually learned by reading an article written by Tred Barta. He said that tuna have to be fought aggressively and that they can never be allowed to rest. This made sense, and helped me understand why I had lost all those battles at Corbetena. To win, he wrote, the angler needs to fight the fish aggressively, as if he didn’t care of the fish got off- exactly the opposite of what I’d done at Corbetena. I’d been playing grandma ball. Another technique involved subduing the fish. I typed in “tuna kill” or something like that on Google, and up came a picture of a tuna’s head with the exact point to hit him. According to the article, you hit him there once, and he’s done thrashing. So my plan was to just keep poking until I reached that one spot, and then I’d be victorious….in theory. Well, the first couple day doing this mother shipping produced no results, so when the charter was over, I had the captain drop me off about a mile from shore, and I paddled back solo, hoping to get a fish before the sun set.. I was kind of creeped out because just that week there had been warnings in the paper due to a recent influx of tiger sharks in the area. The charter boats dump their carcasses in the waters just outside the harbor mouth, which was attracting them, and that was where I was paddling! But it was either stay out on the water or go back to the hotel, and I was so amped up for my battle with the tuna that relaxing wasn’t an option. I carry a portable fish finder with me, and once I located a steep drop-off, jigged up a small fish that I proceeded to drop back down. Minutes later this bait gets slammed, and my first thought is, TIGER SHARK! Needless to say the entire time I had all ten toes in my kayak. It turned out to be a big ulua, or giant trevally, 55 pounds of solid muscle attitude. This same spot turned out to be the honey pot for me; the very next day I returned to back to the same spot after another fruitless day of mothershipping, and I landed another one. That’s not all, though- on the third day, I decided to give the mother shipping project a rest, and paddled out with a friend of mine. He hooked a 20 pound tuna, and then left a big trail of blood when he speared it. Ten minutes later, he’s hooked up to something huge, getting towed around like the outro skit to Benny Hill, and it turned out to be the real deal- a 300 pound tiger! As I was paddling over to “assist” him (we made a sacred pledge to back each other up if something like this happened), my bait gets hit, and I’m on to something huge. He cuts the shark loose, catches up with me 30 minutes later, and it turns out to be another ulua- this time 64 pounds! With all this luck, I almost lost track of my quest to land a big tuna, and to tell you the truth, with only one more day left to go, I didn’t think it was going to happen. I loaded my kayak onto the ship at dawn, and we set out of the harbor at dawn. Hours passed without a strike, and anxiousness slowly gave way to hopelessness. Then the calm is interrupted by a reel going into full scream; the “Big Pink” jet gets hit and all hell breaks loose. I grab the rod, set the hook, and seconds later, I’m in my kayak, lashed to something downright mean.. This thing headed straight down, and I could tell that it was a tuna- a big tuna. The massive head shakes and incredible surges were amplified by the fact that my 2 speed 30 reel was rigged with braided line- I could feel everything the fish did. All the mental and physical training I did in preparation for this very moment paid off big-time as I went into full animal mode. I took the fight to the tuna, and even though I was hoping to God that he wouldn’t come loose, I fought him as if I didn’t care what happened. I kept heaving on that head of his and cranking, never letting him get into a rhythm. Really I was bluffing, because this was a fish that was way more powerful than I, but I made him think that I was twenty feet tall. People ask me what it was like to fight a 111 pound tuna from a kayak, and the first thing that comes to mind is, you know how moms lift cars off of the ground when their baby is stuck under the tire? It was like that. I don’t remember the pain- I remember thinking, take away his will to live. Luckily, my rod worked perfectly. Even though this fish was huge, I could deal with him, because I was able to make full use of my entire upper body strength. The graphite rod was forgiving enough to bend when I needed it to absorb a lunge, but otherwise it exacted a tremendous toll on the fish, unlike the spongy fiberglass rods I had used in the past that stayed bent and didn’t recover with insistence. So I reel like crazy, and the next thing you know, up comes the birds nest from hell. My braided line was all tangled up with the mono topshot, I’m talking like a full cantaloupe sized bale of hay, and there ain’t no way it’s coming through those rollers. I have gloves on, so I started hand lining him up. The fish sill hasn’t surfaced and I can barely feel him, and then, to top it all off, another lure appears stuck on the line- one of the other lures that had been dragging from the boat had gotten tangled up in this line! I grab that lure up, and realize it’s got two 20/0 J hooks on it! Then the fish surfaces about 7 feet from me. So here’s the picture: I’ve got a giant birds nest in my lap that’s now wrapped all over my legs, ] I’m holding into the last bit of 400 pound leader, and my hand is between the fish and two 20/0 hooks. If the fish takes off these hooks are going right into my hand. 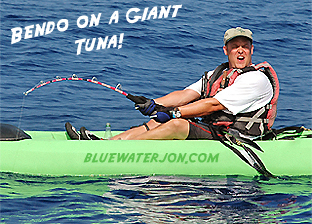 There was a cameraman on board filming this for action adventure fishing movie called Bluewater Jon and the Giant Tuna, available at www.bluewaterjon.com, and you can hear the guys on the boat starting to freak out because they think the tuna is going to take me down with him. This isn’t about having fun anymore- it’s about survival. Cutting the tuna loose never occurred to me- I was too committed. So I got out my spear and turned caveman. I went absolutely ballistic on this fish, hitting him repeatedly in the head, hoping to take the fight out of him before he took off and drowned me; it was literally him or me. When I hit him, huge fountains of blood erupt. I think he’ll pass out soon, but then he goes on a run, thankfully a horizontal one, towing me about 30 yards and thrashing his tail in the water, like the blade of a crashing helicopter, and all the while, I’m hanging on for dear life, hoping he’ll succumb to my desperate assault. The guys on the boat back down to me and hand me a gaff. Now I’ve got a gaff in him and a spear going in and out of his head, and he won’t give up. He continues on these mad lunges, sometimes getting right under the kayak, and sometimes pulling up right next to the kayak’s edge, so that we’re bashing into each other, like a high speed car chase, with one car trying to slow the other one down, and the other trying to escape. At one point, I look at him, wondering where that sweet spot is that I can hit and take him out, and he stares straight into my eyes! He takes off on another horizontal drive again, dragging me with him, but this time, at the end of the surge, he goes belly up. At this point the guys on the boat go totally bananas with joy, and in hindsight, I can’t blame them. They were powerless to do anything during the whole 10 minute surface battle, and they thought this tuna was going to kill me. Now it seems I’ve outlasted the fish, and they are hooting and hollering. Me, I was just in a state of shock. It may be the closest thing I’ll ever experience to a life and death battle. Fortunately, I escaped the battle unscathed, and looking back, I can’t believe how lucky I was. 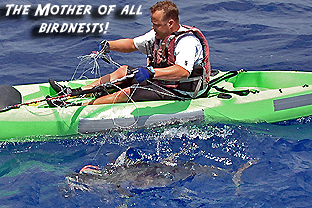 Lucky in the sense that I wanted to see if I had what it took to raise a huge tuna singlehandedly from a kayak.